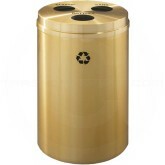 RecyclePro 3 provides 20" diameter receptacles designed to collect three types of recyclables or two types of recyclables plus waste in a single container. 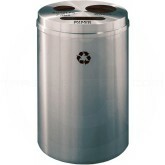 This series includes a heavy gauge galvanized steel inner container with an aluminum bottom. Five different openings are available in five possible combinations will allow your facility to implement an instant recycling program with minimal space and cost. Each opening has a separate poly bag below, supported by a special retainer system. 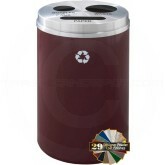 Either 25%, 33% or 50% capacity is provided, depending on the particular opening and model. Each bag is designed to expand into more than its designated capacity as space allows. 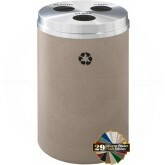 Similarly to the RecyclePro 2 design, there is no rigid metal divider between bags. 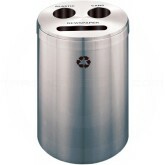 This "Smart RecyclePro" product has a high efficiency factor which translates into less service and maintenance. More than one RecyclePro 3 unit may be used together if desired. 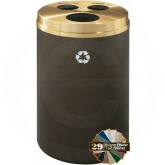 They may be placed near a single purpose RecyclePro 1 or a dual purpose RecyclePro 2 unit. 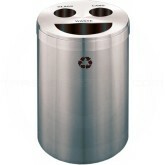 Yes, they are all part of the same family and are made to mix and match!